No one government in the Commonwealth exercises power over the others, as is the case in a political union. Rather, the Commonwealth is an international organisation in which countries with diverse social, political, and economic backgrounds are regarded as equal in status, and cooperate within a framework of common values and goals, as outlined in the Singapore Declaration issued in 1971. Such common values and goals include the promotion of democracy, human rights, good governance, the rule of law, individual liberty, egalitarianism, free trade, multilateralism, and world peace, which are promoted through multilateral projects and meetings, such as the Commonwealth Games, held once every four years. The symbol of this free association is Queen Elizabeth II, who serves as the Head of the Commonwealth. This position, however, does not imbue her with any political or executive power over any Commonwealth member states; the position is purely symbolic, and it is the Commonwealth Secretary-General who is the chief executive of the Commonwealth. The Commonwealth was first officially formed in 1931 when the Statute of Westminster gave legal recognition to the sovereignty of dominions. Known as the "British Commonwealth", the original members were the United Kingdom, Canada, Australia, New Zealand, South Africa, Irish Free State, and Newfoundland, although Australia and New Zealand did not adopt the statute until 1942 and 1947 respectively. In 1949, the London Declaration was signed and marked the birth of the modern Commonwealth and the adoption of its present name. The newest member is Rwanda, which joined on 29 November 2009. The most recent departure was the Maldives, which severed its connection with the Commonwealth on 13 October 2016. As of April 2017, of the states that are members of the Commonwealth of Nations, three are in Europe, twelve in North America and the Caribbean, one in South America, nineteen in Africa, seven in Asia, and eleven in Oceania. There are seven former members, four of which no longer exist as independent entities (but form part of current member states). The members have a combined population of 2.4 billion, almost a third of the world population, of whom 1.21 billion live in India, and 95% live in Asia and Africa combined. Currently sixteen of the member states are Commonwealth realms, with the Head of the Commonwealth as their head of state. Five others are monarchies with their own individual monarchs (Brunei, Eswatini, Lesotho, Malaysia, Tonga) and the rest are republics. Republic of Ireland (from 1949 according to the Commonwealth; 1936 according to Irish government), Zimbabwe (2003), and Maldives (2016) are former members of the Commonwealth. South Africa, Pakistan and The Gambia left and later rejoined the Commonwealth. All dates below are provided by the Commonwealth of Nations Secretariat members list, and population figures are as of 1 January 2018. Australia[D] 1931-12-1111 December 1931 Oceania 25,215,000 Granted nominal independence (Dominion status) on 1 January 1901. Australia was one of the original Dominions at the time of the Statute of Westminster 1931, although the statute was not adopted in Australia until 1942 (with retroactive effect from 1939). The Australia Act 1986 established specifically, only the State Premier could now advise the Queen on appointment or removal of a State Governor. Nonetheless, the Queen could still exercise any of her powers with respect to the State if she was "personally present" in the State. Bangladesh 1972-04-1818 April 1972 Asia 165,867,307 Declared independence from Pakistan in 1971. Cameroon 1995-11-1313 November 1995 Africa 24,836,674 Most of the country was the formerly French mandate territory (later UN trust territory) of Cameroun and gained independence from France on 1 January 1960, uniting with the much smaller former British mandate/trust territory of Southern Cameroons on its gaining independence from the United Kingdom on 1 October 1961. Canada[D] 1931-12-1111 December 1931 North America 36,885,861 Granted nominal independence (Dominion status) on 1 July 1867. Canada was the first among the several original Dominions at the time of the Statute of Westminster 1931. Incorporated another original Dominion, Newfoundland, on 31 March 1949. The Canada Act 1982 formally ended the "request and consent" provisions of the Statute of Westminster 1931 in relation to Canada, whereby the British parliament had a general power to pass laws extending to Canada at its own request. Cyprus[E] 1961-03-1313 March 1961 Eurasia 1,197,667 Gained independence from the United Kingdom on 16 August 1960. Fiji[B] 1970-10-1010 October 1970 Oceania 909,024 Left in 1987; rejoined in 1997; suspended on 6 June 2000; suspension lifted on 20 December 2001; again suspended on 8 December 2006 because of the 2006 Fijian coup d'état. Suspension lifted on 26 September 2014. The Gambia 1965-02-1818 February 1965 Africa 2,155,958 Withdrew on 3 October 2013 citing "neo-colonialism". Following the election of Adama Barrow as President of Gambia in 2016, it submitted an application to re-join the Commonwealth on 22 January 2018, and rejoined on 8 February 2018. India 1947-08-1515 August 1947 Asia 1,353,014,094 Incorporated former French India (Chandannagar from 2 May 1950 and Puducherry, Karaikal, Yanam and Mahé from 1 November 1954), former Portuguese India (Goa, Daman and Diu from 19 December 1961 and Dadra and Nagar Haveli formally from 1961) and Sikkim (from 16 May 1975). Malaysia 1957-08-3131 August 1957 Asia 31,505,208 Joined as the Federation of Malaya in 1957; reformed as Malaysia on 16 September 1963 with its federation with Singapore (which became a separate state on 9 August 1965), North Borneo, and Sarawak. Mozambique 1995-11-1313 November 1995 Africa 29,977,238 Gained independence from Portugal on 26 June 1975. The first country to be admitted to the Commonwealth without any former colonial or constitutional links with the United Kingdom. Namibia 1990-03-2121 March 1990 Africa 2,600,857 Gained independence from South Africa. Includes Walvis Bay and the Penguin Islands transferred by South Africa at midnight 28 February 1994. Nauru[B] 1968-11-01†1 November 1968 Oceania 10,387 Gained independence on 31 January 1968 from joint trusteeship of Australia, New Zealand and United Kingdom. A special member from 1 November 1968 until 1 May 1999, when it became a full member, before reverting to special status in January 2006. A full member again since June 2011. New Zealand[D] 1931-12-1111 December 1931 Oceania 4,609,755 Granted nominal independence (Dominion status) on 26 September 1907. One of the original Dominions at the time of the Statute of Westminster 1931, although the Statute was not adopted in New Zealand until 1947. Removed final links with the British Parliament in 1986. Nigeria 1960-10-011 October 1960 Africa 194,615,054 Incorporated the former British mandate/trust territory of Northern Cameroons on 31 May 1961. Suspended in 1995, suspension lifted in 1999. Pakistan 1947-08-1414 August 1947[C] Asia 199,031,265 Includes the city of Gwadar, transferred from Muscat and Oman on 8 September 1958. Included Bangladesh (then known as East Pakistan) until 1971. Left Commonwealth in 1972, rejoined 1989; suspended in 1999, suspension lifted in 2004; again suspended in 2007, suspension lifted in 2008. Papua New Guinea[D] 1975-09-1616 September 1975 Oceania 8,034,630 Gained independence from Australia. Rwanda 2009-11-2929 November 2009 Africa 12,322,920 Gained independence from Belgium on 1 July 1962. 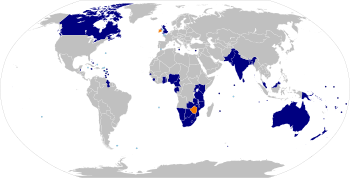 The second country (after Mozambique) to be admitted to the Commonwealth without any former colonial or constitutional links with the United Kingdom. Unlike Mozambique, has adopted English as an official language since joining. Saint Vincent and the Grenadines[D] 1979-10-2727 October 1979 Caribbean 109,501 A special member from 27 October 1979 until 1 June 1985. Samoa[B] 1970-08-2828 August 1970 Oceania 196,954 Gained independence from New Zealand on 1 January 1962. Joined as Western Samoa, subsequently changing its name to Samoa on 4 July 1997. Singapore[B] 1965-10-15†9 August 1966 (effective from 9 August 1965) Asia 5,889,117 Gained independence from the United Kingdom and joined Federation of Malaysia on 16 September 1963. Became independent on 9 August 1965. South Africa 1931-12-1111 December 1931 Africa 56,007,479 Granted nominal independence (Dominion status) on 31 May 1910. One of the original Dominions at the time of the Statute of Westminster 1931. Left on 31 May 1961; rejoined 1 June 1994. Tanzania 1961-12-099 December 1961 Africa 57,790,062 Joined as Tanganyika and later Zanzibar, which subsequently merged to form Tanzania on 26 April 1964. Trinidad and Tobago 1962-08-3131 August 1962 Caribbean 1,376,801 Granted nominal independence (Dominion status) on 31 August 1962. Became a republic within the Commonwealth on August 1, 1976 under the Republic of Trinidad and Tobago Constitution Act 1976, passed by the Parliament of Trinidad and Tobago. Tuvalu[B][D] 1978-10-011 October 1978 Oceania 10,116 A special member from 1 October 1978 until 1 September 2000. United Kingdom 1931-12-1111 December 1931 Europe 65,746,853 The Parliament of the United Kingdom enacted the Statute of Westminster 1931. Vanuatu[B] 1980-07-3030 July 1980 Oceania 279,953 Gained independence from joint rule of France and United Kingdom. ^ A. Unless otherwise noted, independence was gained from the United Kingdom on the date (shown in column 2) of joining the Commonwealth. ^ B. Not a member of the Commonwealth Foundation. ^ C. Though Pakistan celebrates 14 August 1947 as its independence day, independence was officially granted at midnight, 15 August 1947. Therefore, its date of joining the Commonwealth would be 15 August 1947. ^ D. Commonwealth realms, recognising Queen Elizabeth II as their head of state since the day of their independence, distinctly from her being the sovereign of the United Kingdom. ^ E. Geopolitically part of Europe, but geographically part of Asia. Republic of Ireland 1931-12-1111 December 1931 Europe 1949-04-1818 April 1949 One of the original Dominions at the time of the Statute of Westminster 1931. Withdrew after passing the Republic of Ireland Act in 1948, accepted by the United Kingdom in 1949 Ireland Act 1949. Maldives 1982-07-099 July 1982 Asia 2016-10-1313 October 2016 Gained independence from the United Kingdom on 26 July 1965. A special member from 9 July 1982 until 20 July 1985. Announced on 13 October 2016 that it has withdrawn from the Commonwealth. The cabinet of Ibrahim Mohamed Solih announced on November 26, 2018 that the Maldives is to return to its status as a Commonwealth republic and the application to rejoin was submitted on December 10, 2018. Zimbabwe 1980-10-011 October 1980 Africa 2003-12-077 December 2003 Suspended on 19 March 2002. Withdrew voluntarily on 7 December 2003. On 15 May 2018, President Emmerson Mnangagwa submitted an application to rejoin the Commonwealth. Malaysia Reformed as the Federation of Malaysia with Singapore (became a separate member in 1965), Sabah, and Sarawak. Canada One of the original Dominions at the time of the Statute of Westminster 1931. Government suspended on 16 February 1934, merged into Canada on 31 March 1949. Tanzania The two countries merged to form Tanzania on 26 April 1964. Somaliland 2009 Africa ~3,500,000[F] Somaliland is an unrecognised self-declared sovereign state internationally recognised as part of Somalia. It has applied to join the Commonwealth under observer status. Its borders approximate to those of British Somaliland, which was a protectorate from 1884 to 1960. Sudan 2009 Africa 42,425,989 Sudan was a condominium of the United Kingdom and Egypt known as Anglo-Egyptian Sudan, but in practice the structure of the Condominium ensured full British control over the Sudan until its independence in 1956. Sudan has expressed an interest in joining the Commonwealth. South Sudan 2011 Africa 13,670,642 Gained independence from Britain as part of Sudan in 1956. Gained independence from Sudan in 2011. Suriname 2012 South America 555,934 English colony of Willoughbyland from 1650 to 1667 and controlled by the British from 1799 to 1816. Subsequently, a Dutch colony. In 2012, Suriname announced plans to join the Commonwealth and the British government has made it a priority to provide guidance to Suriname in applying for Commonwealth membership. Zimbabwe 2018 Africa 16,150,362 In recent years, under the presidency of Robert Mugabe, Zimbabwe has dominated Commonwealth affairs, creating acrimonious splits in the organisation. Zimbabwe was suspended in 2002 for breaching the Harare Declaration. In 2003, when the Commonwealth refused to lift the suspension, Zimbabwe withdrew from the Commonwealth. Since then, the Commonwealth has played a major part in trying to end the political impasse and return Zimbabwe to a state of normality. ^ F. The population figure is based on 2014 estimates. Other states which have expressed an interest in joining the Commonwealth over the years or states which may be eligible to join the Commonwealth include Algeria, Bahrain, Cambodia, Egypt, Eritrea, Israel, Libya, Madagascar, Palestine, United States and Yemen. ^ "FAQs". Commonwealth Secretariat. Archived from the original on 14 May 2008. Retrieved 16 June 2008. ^ "Singapore Declaration of Commonwealth Principles 1971". Commonwealth Secretariat. Archived from the original on 11 May 2008. Retrieved 12 June 2008. ^ "Head of the Commonwealth". Commonwealth Secretariat. Archived from the original on 30 September 2006. Retrieved 16 June 2008. ^ "The Commonwealth–History–Dominion Status". Commonwealth of Nations. Retrieved 16 June 2008. ^ "The Commonwealth–History–Modern Commonwealth". Commonwealth Secretariat. Archived from the original on 11 May 2008. Retrieved 16 June 2008. ^ a b Josh Kron (29 November 2009). "Rwanda Joins British Commonwealth". The New York Times. Retrieved 29 November 2009. ^ "Members". Commonwealth Secretariat. Retrieved 15 February 2008. ^ "World population - Countrymeters". Retrieved 6 March 2018. ^ "Australia". Commonwealth Secretariat. Archived from the original on 2008-02-14. Retrieved 2008-02-15. ^ There is no equivalent provision as to the Commonwealth. However, for both the Commonwealth and the States, constitutional convention effectively excludes the monarch from any personal exercise of governmental power. The 1986 proclamation was an exception, approved by Australian ministers. ^ Kohen, Marcelo G. (2006). Secession. London: Cambridge University Press. p. 122. ISBN 978-0-521-84928-9. ^ a b c "Wind of Change". Commonwealth of Nations. 2016. Retrieved 2016-10-15. ^ Pondi, Jean-Emmanuel (October 1997). "Cameroon and the Commonwealth of Nations". The Round Table. 86 (344): 563–570. doi:10.1080/00358539708454389. ^ "Canada – History". Commonwealth Secretariat. Archived from the original on 18 April 2008. Retrieved 15 February 2008. ^ a b c "Dominion Status". Commonwealth of Nations. 2016. Retrieved 2016-10-15. ^ McIntyre, W. David (January 2000). "Britain and the creation of the Commonwealth Secretariat". Journal of Imperial and Commonwealth History. 28 (1): 135–158. doi:10.1080/03086530008583082. ^ Ingram, Derek; Soal, Judith (February 2007). "Commonwealth Update". The Round Table. 96 (388): 2–28. doi:10.1080/00358530701189734. ^ Fiji suspended from the Commonwealth Archived 2011-04-29 at the Wayback Machine. Commonwealth Secretariat, 1 September 2009; retrieved 11 April 2011. ^ "Statement by Commonwealth Secretary-General Kamalesh Sharma on The Gambia". The Commonwealth. 4 October 2013. Retrieved 6 October 2013. ^ "Gambia quits the Commonwealth". The Guardian. 2 October 2013. Retrieved 5 October 2013. ^ "The Gambia presents formal application to re-join the Commonwealth" (Media Release). The Commonwealth. 23 January 2018. Retrieved 24 January 2018. ^ "The Gambia rejoins the Commonwealth". Commonwealth Secretariat. 8 February 2018. ^ "Malaysia – History". Commonwealth Secretariat. Archived from the original on 3 February 2008. Retrieved 15 February 2008. ^ Ingram, Derek (April 1996). "Commonwealth Update". The Round Table. 85 (338): 153–165. doi:10.1080/00358539608454302. ^ a b "Rwanda becomes a member of the Commonwealth". BBC News. 29 November 2009. Retrieved 29 November 2009. ^ "Nauru Accedes to Full Membership of the Commonwealth". Commonwealth Secretariat. 12 April 1999. Archived from the original on 26 April 2009. Retrieved 30 January 2009. ^ "Nauru–History". Commonwealth Secretariat. Archived from the original on 3 September 2008. Retrieved 15 February 2008. ^ "Nauru back as full Commonwealth member". Radio New Zealand International. 26 June 2011. Retrieved 23 October 2011. ^ "New Zealand – History". Commonwealth Secretariat. Archived from the original on 2 March 2008. Retrieved 15 February 2008. ^ "Nigeria | The Commonwealth". thecommonwealth.org. Retrieved 2017-06-05. ^ "Pakistan suspended from the Commonwealth". Commonwealth Secretariat. 22 November 2007. Archived from the original on 25 August 2012. Retrieved 15 June 2008. ^ "Commonwealth lifts Pakistan suspension". Commonwealth Secretariat. 12 May 2008. Archived from the original on 20 January 2012. Retrieved 15 June 2008. ^ "Constitution Amendment Act (No 2) 1997". Retrieved 27 November 2007. ^ "Road to Independence". AsiaOne. Archived from the original on 13 October 2013. Retrieved 28 June 2006. ^ "South Africa". Commonwealth Secretariat. Retrieved 2016-01-25. ^ a b "Tanzania – History". Commonwealth Secretariat. Archived from the original on 3 September 2008. Retrieved 15 February 2008. ^ "Tuvalu Accedes to Full Membership of the Commonwealth". Commonwealth Secretariat. 14 August 2000. Archived from the original on 11 October 2008. Retrieved 30 January 2009. ^ "Maldives – History". Commonwealth Secretariat. Archived from the original on 5 July 2008. Retrieved 15 February 2008. ^ "The Maldives and the Commonwealth". Republic of Maldives. Retrieved 30 January 2009. ^ "Commonwealth Secretariat". 2016-10-13. Retrieved 2016-10-13. ^ "Maldives quits Commonwealth over alleged rights abuses". The Guardian. 13 October 2016. "The Maldives has announced it will leave the Commonwealth after mounting pressure from the 53-nation group over corruption and deteriorating human rights in the Indian Ocean state. The country’s government, which has been fending off rumours of an impending coup and allegations of money laundering, said the decision on Thursday to cancel its membership was 'difficult but inevitable'. Its foreign ministry said in a statement it had been treated 'unjustly and unfairly' by the organisation’s Commonwealth ministerial action group (CMAG), which has been scrutinising the government since the former president, Mohamed Nasheed, was ousted in 2012 in what his supporters say was a coup. 'The CMAG and the Commonwealth secretariat seem to be convinced that the Maldives, because of the high and favourable reputation that the country enjoys internationally, and also perhaps because it is a small state that lacks material power, would be an easy object that can be used,' the statement said. It added that it was being targeted 'in the name of democracy promotion, to increase the [Commonwealth’s] own relevance and leverage in international politics'." ^ Chris Baynes (December 10, 2018). "Maldives applies to rejoin the Commonwealth after defeat of isolationist president Abdulla Yameen". The Independent. Retrieved February 11, 2018. ^ Howden, Daniel (26 November 2009). "The Big Question: What is the Commonwealth's role, and is it relevant to global politics?". The Independent. London. ^ a b c d e f te Velde-Ashworth, Victoria (10 October 2005). "The future of the modern Commonwealth: Widening vs. deepening?". Commonwealth Policy Studies Unit. Archived from the original (doc) on 23 July 2011. Retrieved 16 September 2006. ^ South Sudan on Track to Join Commonwealth. ^ "Welcome to Allvoices". allvoices.com. Archived from the original on 2013-06-25. ^ Staff Writer. "Suriname eying membership of Commonwealth". Stabroek News. ^ "Strengthening Guyana's participation in the Commonwealth and providing guidance to Suriname as it considers applying for membership". www.gov.uk. ^ "Burundi Applies to Join Commonwealth to Bolster Angolophone Ties". Bloomberg.com. 13 November 2013. ^ Adebayo, Bukola (21 May 2018). "Zimbabwe applies to re-join Commonwealth, 15 years after leaving". CNN. ^ "Israelis and Palestinians could join Commonwealth". The Telegraph. 17 December 2006. "Members". Commonwealth Secretariat. Retrieved 2008-02-15. "Commonwealth of Nations". Commonwealth of Nations. Retrieved 2008-02-15. "The Commonwealth". Directgov. Retrieved 2008-02-15.